Tromboncino, also known as zucchini rampicante is an Italian heirloom squash that derives its name from its fruits that are shaped like a trombone - it looks like a butternut squash with an extra extra long neck. 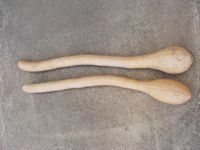 Similar to the butternut, the whole neck is solid and there is only a small seed cavity at the base. All parts are edible and it has a tender, buttery taste with a hint of nutty artichoke flavor. The Tromboncino is a half hardy annual climber with large, ornamental leaves that are liberally splashed with silver. It does not need much ground space and is ideal for growing up an archway or trellis, to allow room for the long fruit to grow and hang freely. The fruit can weigh up to 2 to 3kg each - be sure that your trellis can handle the weight. However, it can also be left to sprawl over the ground and will then produce curvy fruits. The Tromboncino squash is incredible versatile and can grow up to 1 meter if allowed to mature. It can be used both as a summer squash and a winter squash as it has great keeping abilities. The fruit must be picked regularly to prolong the harvest. It can be harvested young at about 25cm long and be eaten as a baby marrow or zucchini. 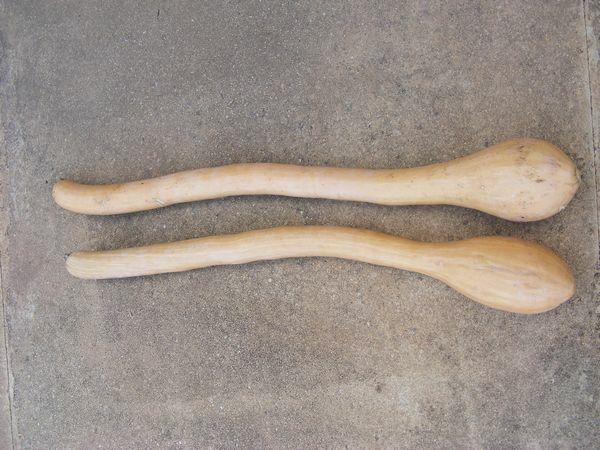 For a winter squash, allow it to stay on the vine until it turned beige like a butternut, and the skin has hardened. Harvest all before the first frost. Tromboncino needs rich, well-fertilized soil in full sun and plenty of watering in dry weather. Unlike other squash, Tromboncino has the advantage that it is insect resistant to squash vine borers and also resistant to mildew. Soak the seed overnight (optional) and sow under cover up to a month before the last frost date. Push the seed, on its side (to prevent it rotting), 2-3cm deep into pots filled of compost. When the plants have 5-6 leaves, they can be transplanted in the garden - 90cm apart in each direction. Alternatively, it can be sown direct in spring after all danger of frost has passed. Days to maturity are 80 to 100 days. Tromboncino squash is similar to butternut and is perfect for steaming, grilling, roasting, frying, or sliced raw in salads. The Italians use it in gnocchi and to stuff ravioli. Like with other pumpkin, the seeds are edible and it can be eaten raw or roasted. Tromboncino squash is rich in vitamins C, E, K and a good number of the B-complex vitamins. It is a source of Omega-3 fatty acid and Omega-6 and is rich in magnesium, manganese and potassium. It also contains calcium, iron, phosphorous and zinc as well as traces of selenium and copper. The high levels of vitamin A is a powerful natural anti-oxidant that is required by the body for maintaining the integrity of skin and mucus membranes as well as for good eye-sight. Research studies suggest also that foods rich in vitamin A help the body protected against lung and oral cavity cancers.